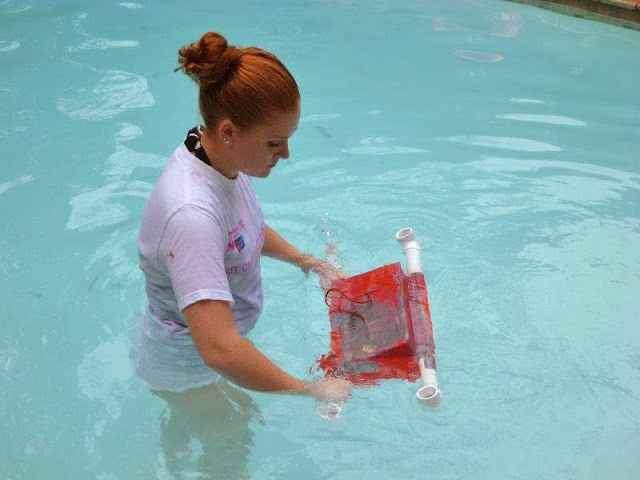 It was a tall order, but high school students rose to the challenge: they integrated physics, engineering, and scientific curiosity and created functional data-gathering drifters. They also became part of a scientific effort to improve predictions of how oil moves through coastal waters and onto shores. 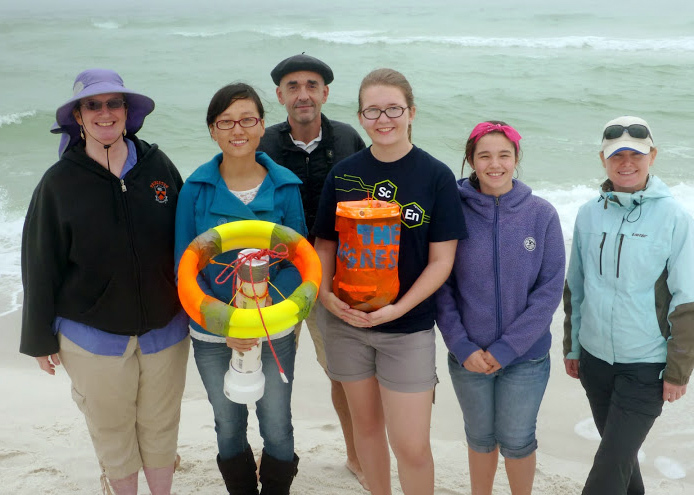 In December at Ft. Walton Beach, Florida, scientists deployed the winning student designs along with 200+ specialized drifters during a three-week long Surfzone Coastal Oil Pathways Experiment (SCOPE), a first-of-its-kind effort for Gulf of Mexico modeling studies. SCOPE is a project of the Consortium for Advanced Research on Transport of Hydrocarbon in the Environment, or CARTHE. Scientists and education specialists with CARTHE collaborated with colleagues from the Deep Sea to Coast Connectivity (Deep-C) research consortium and incorporated local schools as part of the project to extend the wins of this successful experiment beyond the scientific community. 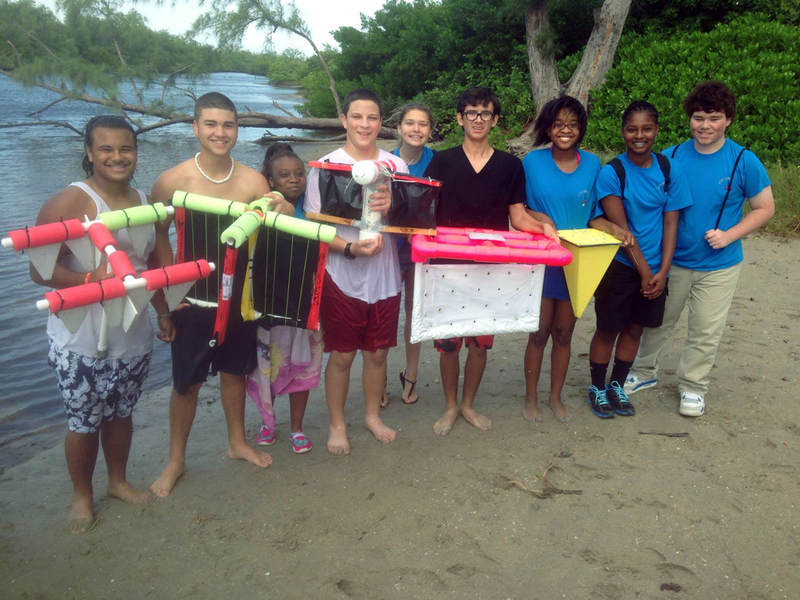 Florida teachers and students from the Maritime and Science Technology Academy (MAST), the Maritime Magnet program at South Broward High School, and the International Baccalaureate program at Rickards High School in Tallahassee worked with scientists and education specialists to learn about drifters. Then the students designed, built, and tested their own devices. The drifters had to be sturdy, biodegradable, colorful, and inexpensive. 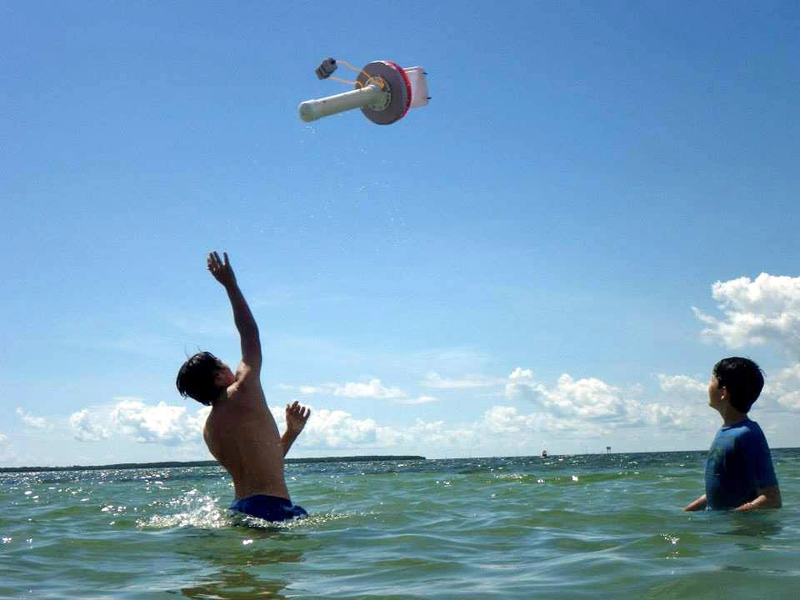 While holding a GPS unit, they had to float upright in the water. They had to be light enough for researchers to easily deploy them in large numbers, yet have enough weight to prevent wind blowing them away. Students had to factor in weather, currents, boats, and other contributors to water movement. Though difficult, students were excited, enthusiastic, and inspired to succeed. Integrating disciplines and coming up with a workable product requires a valuable, yet hard to develop, skill set. Özgökmen explains, “They have to actively read and learn and think for this; very different than one-way information flow from TV, internet, or some traditional classroom activities.” Students had to combine creative energies with engineering efforts, developing and testing multiple approaches to meet drifter criteria. Students also had access to a real-time data management system, allowing them to see drifters in action and think about how ocean current flows and which designs work better than others. Purposely incorporating teachers and students with an ongoing scientific project that fills pressing information needs is a win on many levels: educators directly interact with experts and transfer current science and technology into their teaching; students excitingly engage in hands-on, novel, application-based ocean science; scientists gain new perspectives and increased motivation from student energy and enthusiasm; and society gains a better pool of next-generation-scientists to address future complex environmental and public dangers. And the succession of benefits keep coming. Learn more about this project and future opportunities at www.carthe.org/. 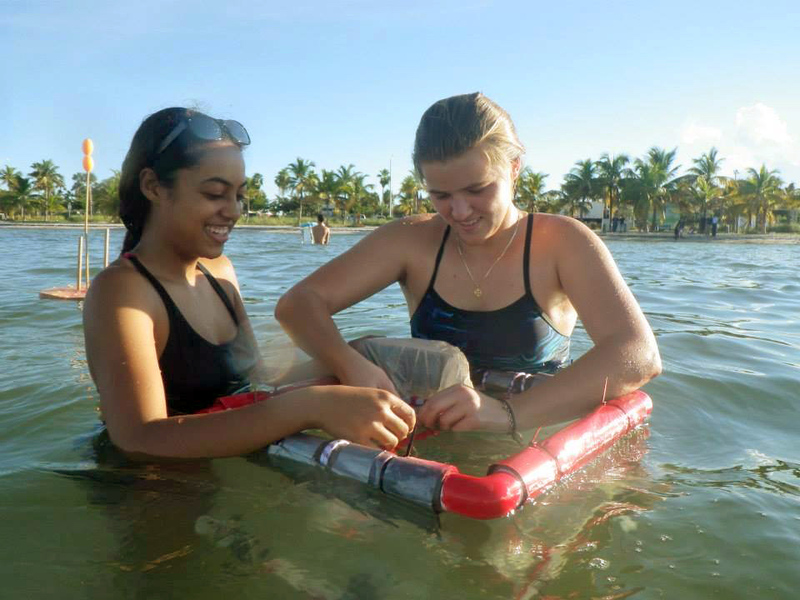 Read the Deep-C Voices from the Field blog about Rickards Students Successful Drifter Deployment. 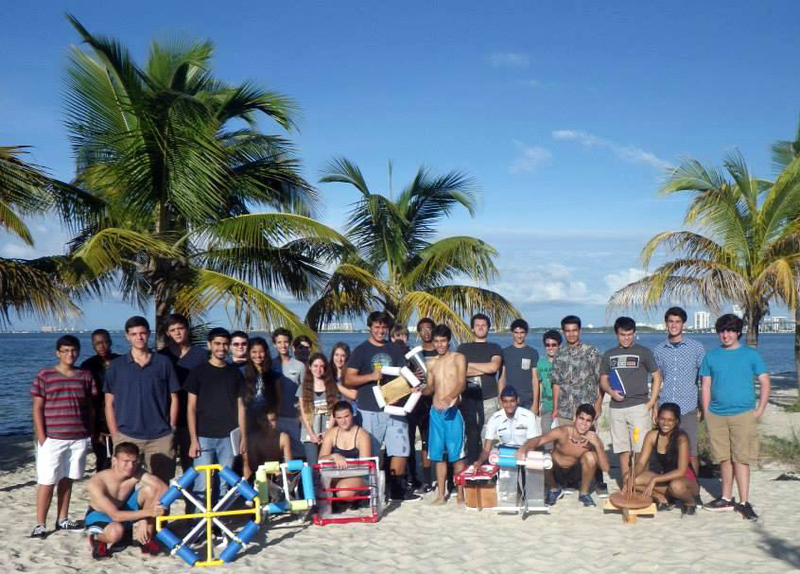 See pictures of drifter testing by students from Maritime Magnet Program at South Broward High School and from MAST Academy. This research was made possible in part by grants from BP/The Gulf of Mexico Research Initiative (GoMRI) to the Consortium for Advanced Research on Transport of Hydrocarbon in the Environment (CARTHE) and to the Deep sea to Coast Connectivity in the Eastern Gulf of Mexico (Deep-C) Consortium. The GoMRI is a 10-year independent research program established to study the effect, and the potential associated impact, of hydrocarbon releases on the environment and public health, as well as to develop improved spill mitigation, oil detection, characterization and remediation technologies. An independent and academic 20-member Research Board makes the funding and research direction decisions to ensure the intellectual quality, effectiveness and academic independence of the GoMRI research. All research data, findings and publications will be made publicly available. The program was established through a $500 million financial commitment from BP. For more information, visit http://gulfresearchinitiative.org/.